Costa Rica has long been one of my all time favourite sport fishing destinations. Not only is this idyllic Central American country amazingly beautiful, but it is safe to visit and really does have something to offer everyone. 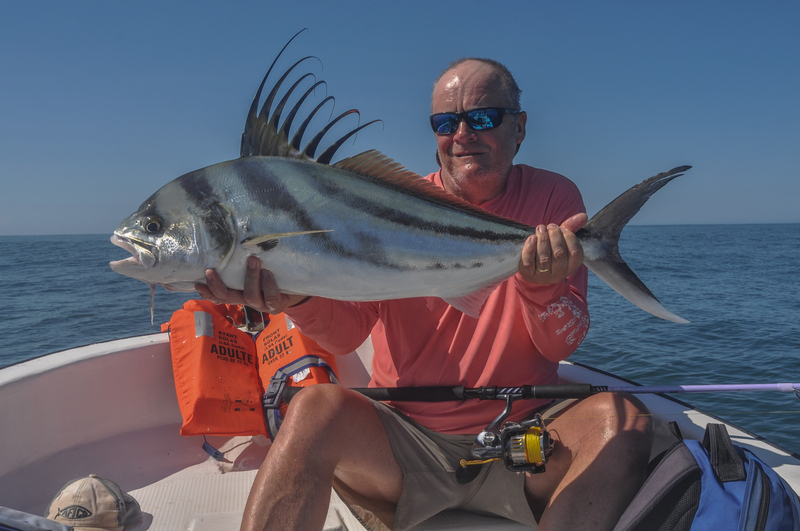 On this latest trip I travelled along with five other anglers to Samara, a small and mostly underdeveloped town on the Pacific coast just south of Nicoya, Guanacaste Province, in the north of the country. The weather during our first two days made for tricky conditions but by day three we enjoyed breakfast under clear blue skies, and the mercury was already well on the rise by the time we boarded our respective boats a little after 7 in the morning. As we headed out of the bay in which Samara is located we soon spotted large shoals of surface feeding tuna and bonito, which provided as much sport as we wanted on small casting jigs fished on light tackle. And the day just got better and better. By the time we returned to Samara that afternoon each of our two boats had caught around half a dozen very nice roosters, a bunch of jacks, and several large dorado. On day four the fishing was incredible. For me it was one of those days when whatever I tried not only worked, but worked well. I personally boated three roosters casting surface poppers, best fish around 30lb, along with numerous jacks and small tuna. I also caught a stunning 30-40lb dorado that inhaled the casting jig I had been using right at the rod tip. That fishes first run, one of several, ripped more than 200 yards of line from the reel. Not only was the fishing throughout the remainder of the trip equally productive, but it got even better, especially for dorado. On the fifth morning we located a weed line that included several large trees, and the sea in the area was thick with feeding dorado. By 10 in the morning the three of us fishing on our boat had already caught in excess of 20 dorado in the 10-25lb class. Throughout that day we located several dense bait balls of brown minnows that were being demolished by feeding frenzy of roosters, jacks, small tuna, Sierra mackerel and dorado. Any lure that was cast in the vicinity of these bait balls was immediately smashed by whichever species managed to grab it first. It was a truly awesome sight. That afternoon as we headed back towards Samara we came across a whale shark. It was totally unperturbed by our presence and after several minutes watching this incredible animal swim around the boat I could no longer contain myself, and I stripped off, dived in and swam down to it. It wasn’t the slightest bit bothered by my presence, even allowing me to gently stroke one of its fins; what an experience. A limited amount of tackle is available for hire at nominal cost by our partners in Samara, but most anglers like to supply their own popping and jigging outfits. I recommend two casting/popping rods, one rated for lures from 20-80g, a second suitable for fishing heavier lures from 100-150g. These I match with an 8000 and 14000 size fixed spool reel respectively, loaded with 60 and 80lbBS braid. Carry a selection of lures to include small to medium size poppers, stick baits, diving plugs and casting rigs. Most colours will catch a few fish, but pink is absolutely essential in these waters, it was certainly the most productive colour lure during our trip. As always, be sure to use only strong hooks, split rings, links and swivels. Jigging is also productive, both speed jigging and the increasingly popular slow jigging. Rods suitable for fishing jigs between 50-200g are perfect, matched with either a fixed spool or multiplier reel loaded with braid. Again pink is a highly effective colour. All of my rods, casting and jigging, are Shimano STC multi-piece travel rods that fit easily inside my hold luggage. I honestly cannot remember the last time I travelled with a rod tube. This entry was posted in Costa Rica by anglersworldinfo. Bookmark the permalink.